Jungle revival pioneers Ed Solo & Deekline, bosses of the world's leading Jungle/DnB label 'Jungle Cakes' present the much anticipated follow up to their commercially and critically acclaimed album 'Welcome To The Jungle'. Leading the way on this compilation is Deekline's new Jungle smash 'Good To Have The Feeling' featuring Tippa Irie that is blowing up on BBC Radio 1 via top tastemakers MistaJam and Toddla T. This track is exclusive to the album, and set for a full commercial release, with video and remixes in 2015. Hot on its heels co-honcho Ed Solo, and Deekline team up again on yet another huge exclusive with 'Hit The Road Jack' a new jump up Jungle cover of the popular Ray Charles original that is set to go down a storm! On this second edition of Welcome To The Jungle, Ed Solo & Deekline delve deeper into their roots, and influences with a heady brew of Jungle cuts old and new. From stone cold classics: Ray Keith - Chopper (Shy FX Remix), to DJ Hype ft. MC Fats - Peace, Love & Unity, plus new remixes of classic anthems: DJ SS - The Lighter (Bladerunner Remix), and Krome & Time - The License (Break Remix), DJ Rap - Spritual Aura (Blade Runner & Saxxon Remix). Also, featured are hot Jungle remixes from some of the biggest names in Drum & Bass from current chart toppers Chase & Status, and Sigma. Alongside tracks and remixes from scene leaders Serial Killaz, Benny Page, Marcus Visionary, and many more. 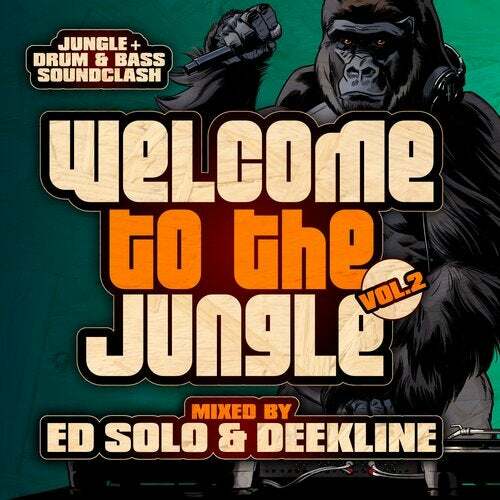 Mixed live by Ed Solo & Deekline over 2 continuous mixes, and crammed with 28 up front exclusives, VIP mixes, classics, and fresh cuts from Jungle Cakes, Welcome To The Jungle Vol. 2 is THE essential Jungle + Drum & Bass compilation for 2015 and beyond.